Aussie Invader III - 26,000 kW 641 mph. Make a bid. In August 2017, Rick Bushell took a group of us on a most enjoyable run to Gosford Car Museum to check out the varied display of cars on show. Alas, the museum is now closed. "The Gosford Car Museum has closed its doors with the loss of 40 jobs after a two-year battle with the Australian Taxation Office. Opened in April 2016, the museum boasted the largest privately-owned car collection in the Southern Hemisphere. Valued at over $70 million, it became one of the best places to visit on the NSW Central Coast - especially for the motoring enthusiast. The company behind the museum, Auto Invest Pty Ltd, had been established in 2015 as a car dealership using the museum as a way of marketing the vehicles, while also bringing much-needed tourism to the area. On average, over 10,000 visitors passed through the museum’s gates each month. Yet questions were raised by the ATO over the museum’s business model, including its admission fee and an audit was launched in December 2016. The audit found that because Auto Invest had used the term 'museum' in its trading name, charged admission, had cars in the showroom which were different to those purchased by customers, and that not everybody visiting the museum was buying a car - therefore, it was considered to be a dual-purpose business and was also not eligible for Luxury Car Tax (LCT) and GST exemptions. The site of the museum is a former Bunnings Warehouse location, and has been listed for sale. The cars in the museum will be liquidated in a fire sale on April 6-7 with no reserve." $34,000 for a Mini Moke $38,000 for a 1954 Land Rover seems like pretty good money for these old work horses. From our sponsor Shannons website. . .
"Shannons first auction for 2019 in Melbourne saw a bumper crowd, over $2.9 million in sales and a fantastic 93% clearance rate. Standout results included a beautifully restored and presented 1954 Land-Rover Series 1 SWB 4X4 wagon which smashed its guiding range of $14,000-$18,000, selling after strong phone and online bidding for $38,000, highlighting the increasing attraction of early four-wheel drive vehicles." Here is a blast from the past. Six different signals you can give when driving to indicate your intended direction. 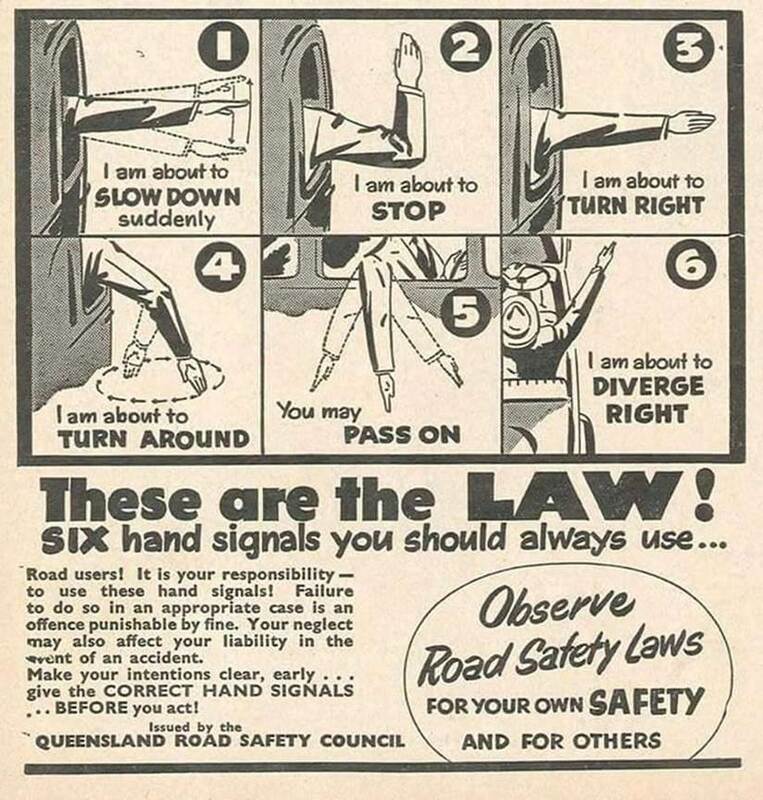 Not advisable to try them from anything other than a pushbike though... it costs $298 in NSW if you hang your arm out of a vehicle for any reason! And even then, other than turning right, most of them would mean nothing to today's drivers. The Great Eastland HUB Rally went off flawlessly over the October long weekend and received much praise from those attending. Seventy cars enjoyed ideal Mid-North Coast Spring days on the Saturday and Sunday runs. The Laurieton United Services Club put on excellent meals at the dinners on Saturday and Sunday evenings, and everyone liked the old fashioned fresh salad served at the Wauchope Show ground on judging day. HUB Chairman, Norm Dunn thanked both HUB Committee members and all the Club members who pitched in to keep things running smoothly. The highlight of the weekend was the tour of the sprawling workshops of Expressway Spares. We were even privileged to have Patrick Cassegrain, son of the founder Gerard "Froggy" Cassegrain, tell of the origins of the business, take us through the Sancrox sheds and workshops. The winner of "Most Desired Car" went to the immaculately presented 1937 MG SA owned by Don Philips of Taree Historic Motor Club while the hard luck story of the weekend went to Brian Jamieson from Taree who started out in a Suburu Sherpa. That broke down so he had to go home and collect his modern car, then was able to borrow a Fiat 500 to do the runs in. Demerit point increase From 17 September 2018. Drivers who use a mobile phone illegally will be penalised an extra demerit point, up from four to five. In double demerit points, it doubles to 10 points. If you've lost 3 points for any offence in the last year or do so in the next 3 years, there goes your licence. That's for ordinary licences, special licences have even less points to play with. Distracted driving is fast becoming a severe and growing threat to road safety. Can be operated without touching any part of the phone, such as via Bluetooth or voice activation. Drivers are able to use their mobile phone as a driver’s aid (e.g. GPS) only if the phone is in a cradle fixed to the vehicle and doesn’t obscure their view of the road. 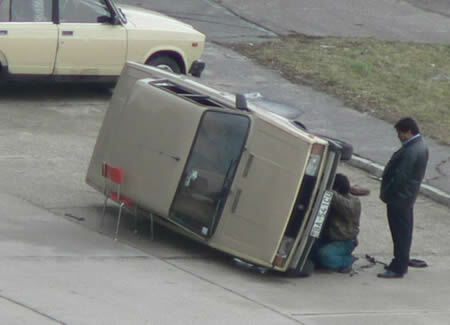 Many of our members tow vans and trailers and rules keep changing. They also differ from state to state, as John Gunn found when touring through the outback and some of his group ran foul of the rule specifying the height a number plate must be from the ground.... different from NSW to Queensland! 0 – 750 kg loaded weight – no brakes required. 751 – 2000 kg loaded weight – braking on both wheels on at least one axle. 2001– 4500 kg loaded weight – braking on all wheels, and an automatic breakaway system in case the trailer becomes detached from the vehicle. Brakes must be operable from the driver’s seating position. As short as practicable and connected to the towing vehicle. Crossed over if two chains are ﬁtted. There has been a controversy over shackle sizes and a hoax about Queensland Police blitzing caravaners for illegal shackles. It is still hard to find facts for the real rules that apply in NSW. The relevant Australian standard, 2741-2002, doesn’t specify that rated D-shackles must be used when towing; however, various state-government departments have issued guidelines, and the Caravan Industry Association of Australia has conducted research with shackle manufacturers to develop the following checklist to refer to when buying/using D-shackles for safety chains up to 3500kg capacity. The shackle should meet the requirements of AS 2741-2002. The shackle grade should be ‘S’ or ‘6’. It should have a working load limit of 1000kg. The diameter of the shackle steel should be 10mm. Either a ‘bow’ or ‘dee’ design is deemed suitable; however, a bow shackle design provides a greater angular displacement. The CIAA also notes that “a significant detail to understand is that the breaking load of a shackle is generally six times the working load limit”. A shackle that meets the requirements of AS 2741-2002 will be stamped or marked with the manufacturer’s name, the working load limit and the grade." - and yet the RMS still has this "Pre-delivery Checklist for Caravans" on their website which seems to indicate a 12.7mm (??) diam is required for under 1,000 kg rigs... Huh? "Q: If NSW Police are defecting a vehicle based on the colour coded D-shackle but the AIS Rules are based on the diameter of the d-shackle, do I clear the defect based on the colour or the diameter of the d-shackle. A: Roads and Maritime cannot enforce the Australian Standard that the colour coded D-shackles need to be compliant to. In this case, Roads and Maritime can only enforce the Road Transport (Vehicle Registration) Regulation 2007. This means you should clear the defect as per the inspection standards ie the diameter. For more information go to AIS Rules 182 and 361 which refer to VSB 1 Building Small Trailers. " The RMS site has many articles outlining all the various rules that must be adhered to on our roads. It may save you a fine to check the changes out and save contributing to the government coffers. At a recent car auction in Bathurst, a 1971 Ford GTHO Phase III has become the first ever Australian made car to top the one million dollar price barrier. The "Big Red" proved to be a fair investment, considering it sold for just north of $5000 new. Bought by cricketing fast bowler Jeff Thomson in the 80's for around $23,000, he no doubt wishes he'd hung onto the classic beast. Jaguar plans to invest millions of dollars in electric vehicle charging stations ahead of the launch of its electric vehicle range in Australia. The vehicle manufacturer is planning to launch its fully electric sports car, the I-Pace, and two hybrid land rovers in September and October, and will invest between $3 million and $4 million building electric vehicle charging stations for the new vehicles ahead of their release. DEADLY asbestos is being detected in an increasing number of classic cars - and unwary buyers are risking tens of thousands of dollars in fines and repairs. DEADLY asbestos is being detected in an increasing number of privately imported classic cars — and unwary buyers are risking thousands of dollars in fines and repairs. Australian Border Force has intercepted more than 50 classic and vintage cars containing asbestos parts so far this year, almost twice as many as the same period last year. Valuable collector cars such as Ford Mustangs, Rolls-Royces, Bentleys and Jaguars — most of which are more than 40 years old — have been caught in the Customs crackdown. Individual importers risk fines of more than $3000 per offence, but the biggest expense is getting car parts tested and replaced. Importers must pay for the testing of suspect parts and then replace them with asbestos-free components before the vehicle can clear Customs — a process that can take months and cost in excess of $20,000. The "Members Cars" page is coming along nicely as more and more club members are contributing snaps of their much loved cars. There are no doubt there are hidden gems tucked away in sheds and garages that we still don't know about. Other cars are seldom brought out so we don't get the opportunity to snap a photo. If you have a photo of a car you own and it's not already featured, please email it to me at colshaw42@hotmail.com. Best photos seem to feature just the car itself, maybe parked on a plain green grassy area, without too much clutter to distract the eye. Some members even have a timeline of restoration photos and maybe a story to go with it. If you do and you would like to share it, send it in and we'll get it up on the site. We already have a couple of links up that are creating interest. This is a reminder that having vehicles on conditional rego is a PRIVILEGE, and there are certain rules that need to be followed. Have in car a copy of both the HARS Monthly Event Sheet and receipt to prove Club Membership is paid up to date. For NON-CLUB ORGANISED DAYS, The scheme allows for 60 other days of car movement for recreation or servicing etc. Before setting out, details must be entered in the Log Book. You must produce the Log Book and prove membership is up to date if asked by police. Failure to do so means you are driving an unregistered, uninsured car. For CLUB ORGANISED EVENTS, no call to the Club Registrar is needed. ALL car movements not on the events list MUST BE RECORDED in the Movements Day Book…. So you MUST RING the Club Registrar, Ken Collins, and leave your NAME and CAR DETAILS to be entered in the Day Book. If your call is answered by a machine, leave you name, rego number and reason for moving (eg fuel, repairs or maintenance). For long trips out of our area, allow one months notice so details can be recorded in minutes. PLEASE ADHERE TO THESE RULES as non-compliance could result in a hefty fine and your Club could be de-registered resulting in no conditional registration for your vehicle or our other members. Your Club Registrar. KEN COLLINS.